My Scouting story really starts when we moved from South Florida to Hiram, GA. My wife Lisa, was very adamant about putting our son, Nicholas, in Scouting. He was born 3 months premature and was diagnosed with a low autism spectrum condition. She had hoped that it would help his introverted personality. She did everything she could with him from Tiger through Webelos 2 (now Arrow of Light). She was his den leader through Cubmaster where he received his Arrow of Light. Four years after he bridged out of Cub Scouting, she is still our Pack’s Cubmaster. 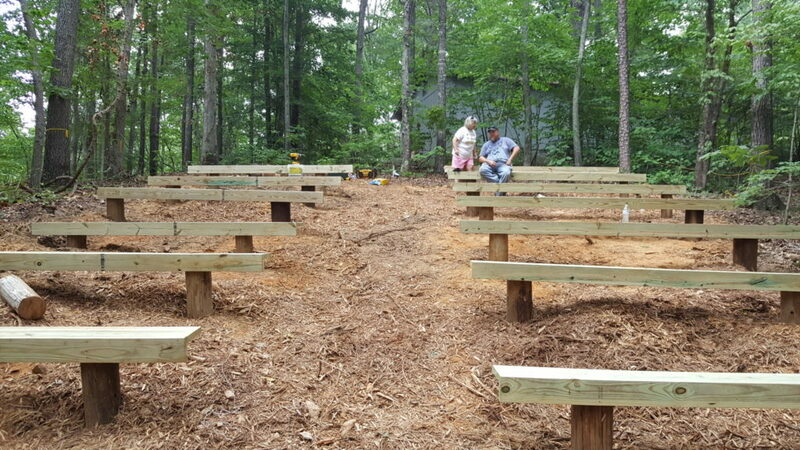 That is where she finds her enjoyment in Scouting.She has run District Day Camp for Pickett’s Mill for the past two years. She is a stay at home mother, but puts in full time hours for our Pack and District. 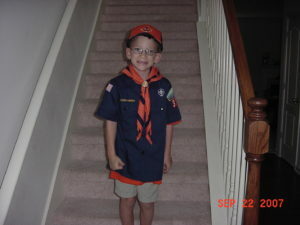 My journey actually started when Nick became a Boy Scout. My wife said that it was a part of Scouting that she could not do. For many years I had put my career first, and finally decided that I had to put my children and wife at the forefront. I had to step up, and I started taking him to meetings. I sat at the back of the room while the boys had their meetings, and I conversed with parents. Then one day in March 2014 at a Pack/Troop campout, one of our Scouts came up to me and asked me to help him plan a weekend hike on the Appalachian Trail. I said sure. He did all of the work, and I helped him facilitate the logistics. That June, we went on our hike. The hike in itself is another story. When we got back from the hike, the boys found out that their Scoutmaster had to step down due to health issues. Our ASM Joe Stone looked at all of the parents and said that he couldn’t do it. We didn’t have any other ASMs to step into the role. I convinced Joe that if he became the Scoutmaster, I would be his Assistant Scoutmaster. And so it was on that day when I assumed the role of ASM and donned the uniform. In the past two years, not only have I become ASM, I’ve become a merit badge counselor, taken Wood Badge, and staffed NYLT. These last two years have happened because of caring adults in the program. I met John Volk, a full fledged Boy Scout in a man’s body. If it were not for his enthusiasm, I would have never taken the Wood Badge course. Of course he was my Scoutmaster, so I think I was actually strong armed into it. Well worth it nonetheless. Because of him, I realized I could impact the boys in our Pack and Troop and possibly the youth in our district. Early on, he helped me realize that the old saying of “It’s how we’ve always done it,” was a poor excuse to make the program survive. He opened the eyes of a lot of people in our Pack and Troop to the possibilities we had to enhance the program for our youth. That stuck with me. During Wood Badge, the Ticket process was described. I knew then and there what I wanted to do. I wrote my Ticket, and spent a lot of time convincing my Troop Guide on why it was important, and that I could actually do what I wanted. I wanted to build a campsite for the youth in our district. Our Chartered Organization was gifted some property over 40 years ago in the middle of the woods, that I could develop to create the site. 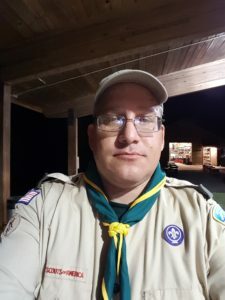 I returned to our Chartered Organization after Wood Badge and went through the process of explaining to the Association what I wanted to do and how I was going to do it. They agreed to let me go forward with the project. Now, here we are many months later, after overcoming a few obstacles with a project that is almost complete. We have an amphitheater, which got written into my Ticket after the fact. 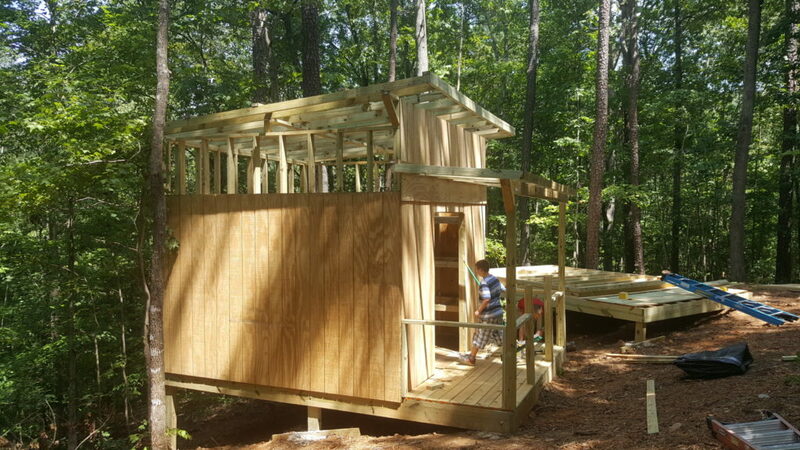 We have a camping shelter that is 90% complete, and a second one that is 10% complete. I do not know if I will be able to complete it in the time span that is given for Wood Badge Ticket items, but that is not important to me. Receiving my Beads is not important. What is important is being able to give the youth an experience and keep them in the Scouting Movement. Larry Barbarossa is the Assistant Scoutmaster of Troop 773, an NYLT staffer and a volunteer in the Pickett’s Mill District. Tagged Wood Badge. Bookmark the permalink.